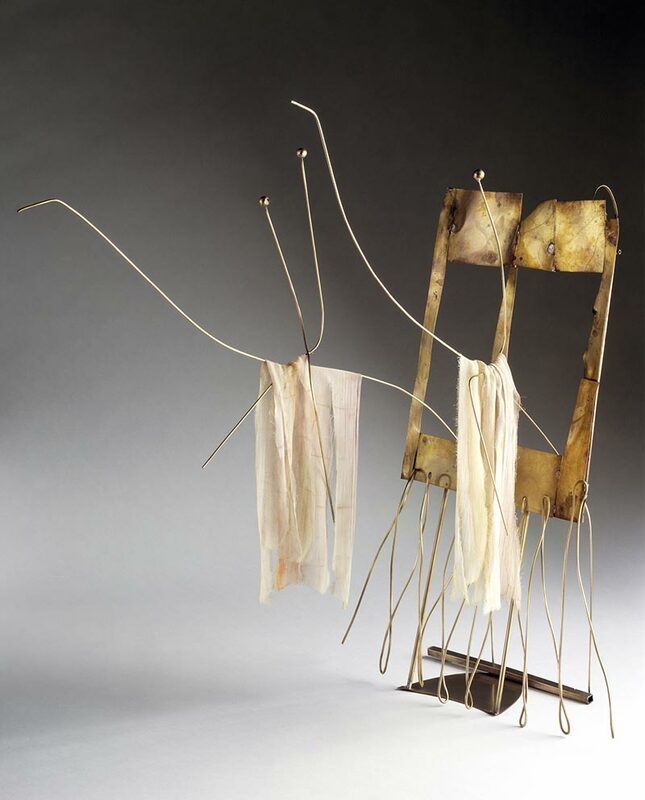 Fausto Melotti (1901–1986) is the quiet man of modern Italian sculpture, little known outside Italy, and currently receiving his first UK retrospective at the Waddington Custot Galleries. Born into a musical family in Rovereto, and trained in electrical engineering before studying at the Brera Academy, Melotti’s brass, ceramic and mixed media structures are precise yet musical, geometric yet anthropomorphic, often surrealist and occasionally whimsical. A classmate and friend of Lucio Fontana, Melotti’s aesthetic is closer to the metaphysical art of Giorgio de Chirico, and the stylised architecture and figures of Massimo Campigli. His work has also been compared to international modern masters including Paul Klee, Alexander Calder and Alberto Giacometti and this exhibition is indicative of an international resurgence of interest in his work. The retrospective includes around 30 pieces spanning his artistic production from the post-war period, when he began working in a more figurative style, to shortly before his death. Although the earliest terracotta works are exhibited together, the show pays little attention to chronology, which emphasises Melotti’s consistency and his repeated return to certain elements. For example, tiny disembodied faces appear on his untitled terracotta piece from c. 1945 and reappear in The Warehouse of Ideas (1960); the spheres with which they are juxtaposed in that work also return in The King’s Nanny (1975); the terracotta She-Devil (c. 1945) reappears in Teatrino (c. 1950). The aquamarine glaze of Teatrino is a rare splash of colour in an exhibition dominated by brass. Melotti combines rough sheets, with wires and moulded forms to create open and closed environments. His use of wire mesh and thin draped fabrics in The Fisherman and his Bait (1972) and The Exit of the Valkyries (1980) interrupts the opacity of his geometric forms. Melotti’s figures, unlike the aforementioned faces, which stare out blankly, are animated and engaging. As seen in The people who live on the moon (1981) and Wagon of Illusions (1984) the figures are deftly rendered with cruciform wires and a spherical head. A highlight of the show is a smaller version of the third sculpture from his monumental series The Magnificent Seven (1973–5). Despite its reduced scale (two metres tall, five metres shorter than the original) and isolation from the other six works in the series, the clarity of this wire frame containing and confining curved and spiralling wires is in no way diminished. Unsurprisingly, the larger-scale works dominate in the light and airy Cork Street galleries. The smaller-scale works, particularly those in plaster and mixed media, feel a little lost. While only a few of the works on display in Cork Street rival the elegance of L’Ariete (1976) a large metal and fabric work sold at Christie’s Italian Sale on 18 October this year, the scale and prominence of this exhibition should do much to establish his reputation in the UK. 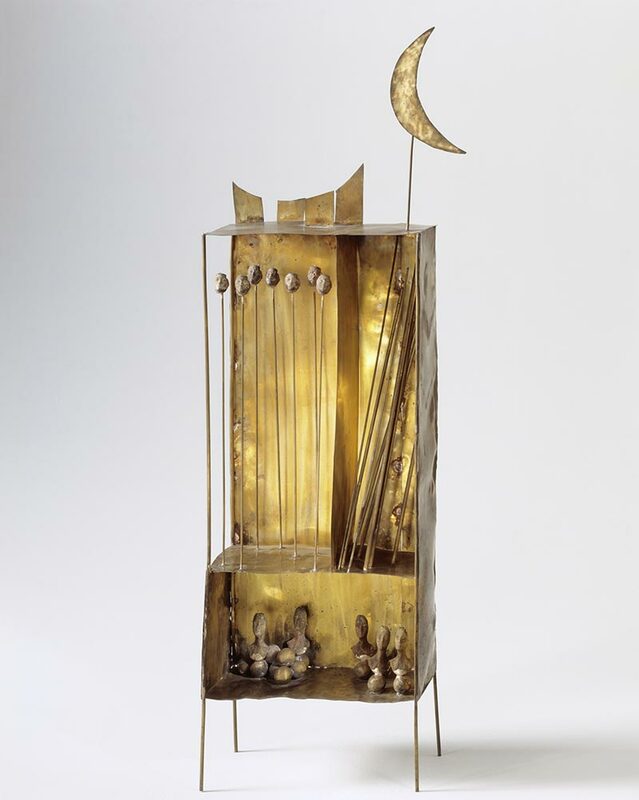 ‘Fausto Melotti’ is at Waddington Custot Galleries until 20 December 2013.